DAUM Commercial Real Estate Services is a real estate brokerage company with offices throughout Arizona and Southern California. The managers of the Phoenix office were concerned about vandals and other unauthorized personnel entering the grounds. Knowing that proper security fencing was the answer to these concerns, DAUM invoked the help of DCS Industries. 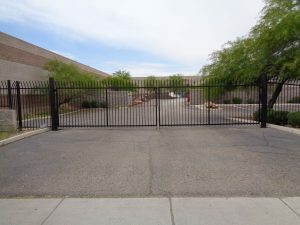 After assessing DAUM’s needs and the property surrounding the Phoenix office, DCS Industries installed two sets of 30-foot security fencing to enclose the perimeter and prevent unauthorized entry. Composed of powerful, black wrought iron, the fencing has an intimidating appearance that is sure to deter intruders. However, if anyone did try to make a forbidden entry onto the property, they would find the security fencing virtually impossible to breach. The gaps between the fence’s pickets are narrow, prohibiting intruders from slipping between them, and the wrought iron is strong and unyielding. 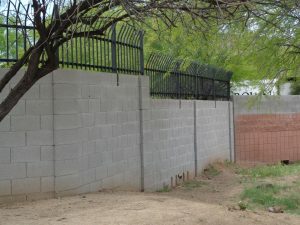 Wrought iron is always an excellent choice for security fencing because it is naturally durable and difficult to climb. The fencing also includes pickets that are curved at the top, contributing to the formidable appearance and adding an extra layer of protection against anyone who might try to scale the fence. In addition to forming a nearly impenetrable barrier against vandals, thieves, and other external threats, wrought iron fencing delivers a strong return on investment for commercial property owners. Due to its inherent strength, wrought iron maintains its integrity for a long time without deteriorating, so property owners should not have to worry about repairing or replacing it for years to come. DCS Industries takes various steps to ensure lasting durability for our wrought iron products. For example, we use only the highest quality materials, including premium-grade steel. We also offer the option of galvanization, which coats the wrought iron with zinc so that it does not rust or sustain damage—even when exposed to intense sunshine, heavy rain, and other elements. Galvanized products from DCS Industries carry a twenty-year warranty. With over ten years of experience, the team at DCS Industries works closely with clients to accommodate the needs and style of any property. We will find the right solution for your business, whether you are seeking to maximize security like DAUM Commercial Real Estate or you simply want to enclose your property while boosting its curb appeal. Call us today at 623-825-7700 for a free estimate!